This contribution on how to become a tutor comes from Trevor Klee. Trevor’s a test-prep tutor in the Boston area, and his part-time tutoring business earns $8000 a month. The business has given him the time freedom to pursue all sorts of new side hustles, including his blog for current and aspiring tutors, JustAddTutor.com. Most people HATE standardized tests. The SAT gives them shivers and the GRE makes them want to cry. But, if you’re someone who like me, who actually likes taking tests, being a test-prep tutor can be a very lucrative side hustle. Rates start at $50/hr for the SAT, and up to $255/hr for the GMAT (the business school exam). There are no certifications or school involved. The best part? With test-prep, you don’t have work that much to make great money. I never work more than 20 hours/week, and I set my own schedule exactly how I want it. Your money investment is minimal: this can all be done for under $250. 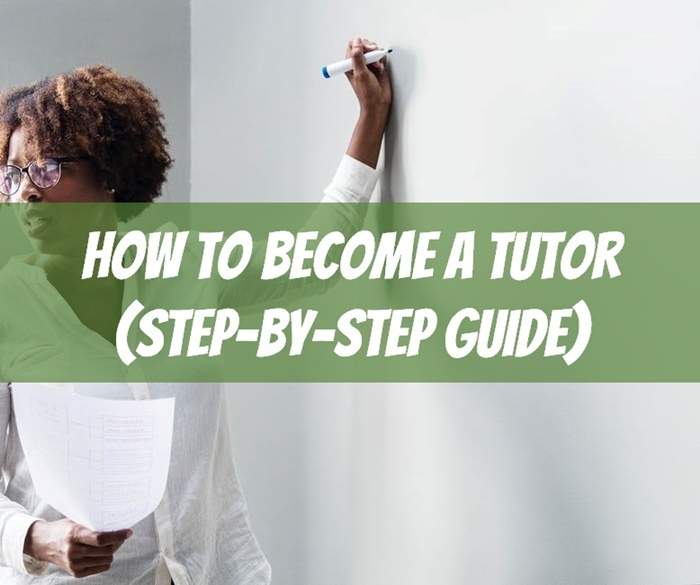 So let’s get started on how to become a tutor! Nick’s Notes: If that’s still too much, or you don’t want to be bothered with any of this marketing stuff, you might consider signing up with a service like VIPKid. You can earn up to $20 an hour teaching English to students in China via videochat. It’s not quite the “lawyer money” Trevor’s talking about, but it’s a start. Just remember to immediately schedule your video interview after completing your application. This is the single most important component of the application process. You will be asked to confirm a time for a live video interview with a VIPKID teaching team member. Live interviews must be scheduled and typically will happen within a couple days (sometimes up to a week) from the time a candidate applied. Because of the time zones, this is probably better the closer to the east coast you are. Picking a niche is crucial. You can have several niches (like I tutor GMAT, GRE, and LSAT), but you can’t just tutor everything. After all, nobody trusts a generalist. I would advise you to first pick a specific test and become an expert in it. If you haven’t already taken it (or it’s been a long time since you did), study for the test like a part-time job, putting in 20 hours a week. Use a mastery learning model, and take this opportunity to practice learning how to teach as a tutor. The above image is an error log, a crucial tutoring tool. This is a screenshot of a student’s error log, based off a template I created. Ideally, all the cells would be dated so the student would be able to see the last time they did a problem, and not leave more than a week before the do it again. It’s color-coded based on how they did on the problem. Once you find a niche and get your score, those are your tutoring credentials. Whenever I meet a new student, my credentials are the first thing they ask about. Plus, this is a good chance for you to develop domain expertise. Once you have a niche, you need to craft a website. You can get a few clients without a website from sites like Craigslist and UniversityTutor, but these sites are unreliable and highly competitive. In my interviews with fellow tutors, I’ve found that Craigslist only provides 1 or 2 leads per month, which is not enough. Instead, you’ll need to rely on a website that you can direct traffic to with ads. The easiest way to craft a website is with a premade WordPress theme for tutors, which is SEO-optimized and includes copy designed to convert visitors into clients. Nick’s Notes: Here’s a tutorial I made on the fastest and cheapest way to build a website. 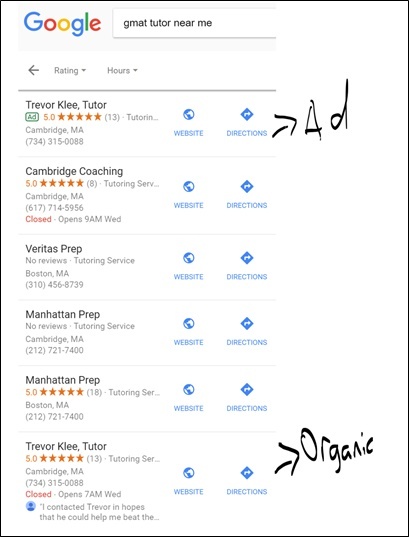 SEO, or search engine optimization, means that you are trying to make sure that Google, Bing, and other search engines can find your tutoring website. Basically, if people search for “tutor near me”, you want your site to show up at the top of the search results. Making sure the pages on your website reflect what people are searching for (on-page SEO). Getting links to your website (off-page SEO). The pages on your website need to reflect the terms that people search for. If you are a physics tutor in Zurich, make sure the pages on your website reflect that. I create a separate page for each subject that I tutor, organized according to web format (with H1, H2 headings). I also make sure that the images on the page reflect what people search, including the names of the images, the titles of the images, and the alt-text. Once you do that, you also need to get links to your website. First, you need to create pages for your website on directories: Google My Business, Yelp, YP.com. You’ll also be getting reviews on these sites later. Second, you can start reaching out to news outlets, friends with blogs, or other sources who’d be willing to link to you. The purpose of your tutoring website is to convert visitors into clients. These four factors can make or break your website, so it’s important to get them perfect. 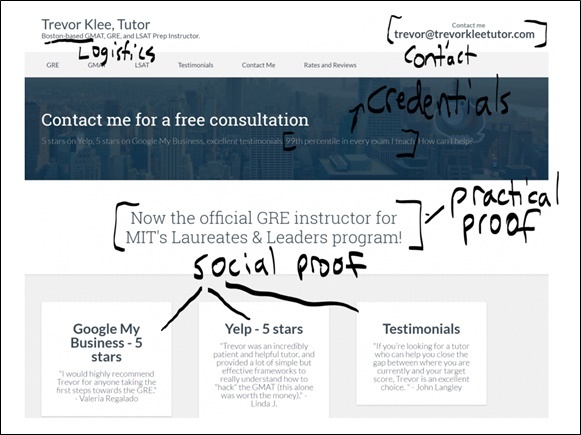 If they’re perfect, you can effectively convert your visitors into tutoring clients. Generally speaking, you should never work for free. After all, it’s not much of a side hustle if you don’t make money. However, in my experience, the hardest part of starting out tutoring (or any service business) is that you’re untrusted. You have no reviews and no social proof. I had a devil of a time convincing my first couple clients to work with me! 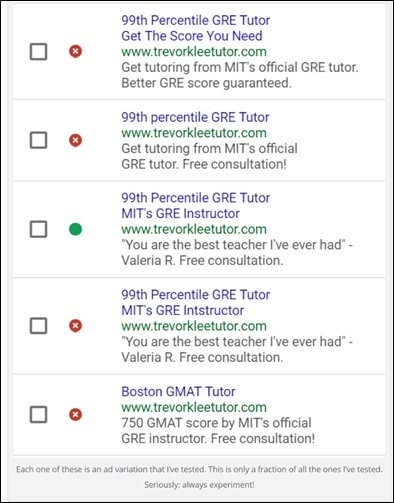 So, when I first started out, I found my first few clients by posting on Reddit, specifically the subreddits for GRE and GMAT. I promised them 4 hours of free tutoring in exchange for reviews and testimonials. A few of them converted into clients, but more importantly, I got the reviews and testimonials I needed for my social proof. This helped a ton on my website, for my web presence (on Google and Yelp), and in my in-person selling process because I was able to mention past clients. This also gave me a chance to develop my tutoring philosophy. I believe in starting with a practice test. This lets me see the students’ individual strengths and weaknesses so I can decide what we’re going to work on first. Second, this makes them jump into the deep end on preparing for their test. I also developed a few key concepts for each test that I drill into the students’ heads, and teach them how to apply it to the problems on their practice test. From then, I guide the sessions based on their strengths and weaknesses, and I have them do homework problems at home and bring their specific issues to the session with me. When we’ve resolved all the initial issues revealed in their practice test, I have them take another practice test. From there, I analyze the strengths and weaknesses, etc. Logistically speaking, I usually work with clients for 2 hours, once per week. This is better for the client, as we can really get a lot done during these two hours. This is also better for me, as I get two hours pay each week instead of one hour. I have people either come to my office (which is at a co-working space), or I teach them over Skype or Google Hangouts, sharing my screen as necessary. I never, ever come to the clients. Nobody will pay you for time traveled, and it’s impossible to book back-to-back sessions if you travel to the clients. Also, it’s nice to get clients who are okay with working over Skype or Google Hangouts, as this allows me to work remotely. I’m not really a big traveler, but I do enjoy the ability to work from home if I want. My first attempts at sales were sort of a disaster. People would call me, and I’d attempt to explain to them in a single phone call why they should sign up with me. Then I’d ask them to make a thousand dollar financial commitment based on that phone call. It’s a miracle that anyone signed up at all! Eventually, I landed on my current sales process. It’s quite casual and low pressure, and it goes as follows. I exchange emails to find out more about the person and their goals. After a few emails, I ask to have a phone call at a specific time and date. I call them exactly when I arranged, and we talk for like 15 minutes. I keep asking them about themselves, what they’re looking to get out of tutoring, and what their ultimate goals are for this exam. I also answer any questions they may have. At the end of the call, I arrange a specific time and date for us to meet in person at my office (or over video chat). I meet them exactly when I said I would, and answer any additional questions they have. Then I explain my tutoring philosophy (as I did above). If they’re okay with that, I confirm the amount they’ll be paying. I close the meeting by arranging a specific time and date for our first tutoring session, and I ask them to pay me 5 or 10 hours in advance, as well as to complete a practice test. After the meeting, I provide email confirmation of the tutoring session time and date, the logistics of payment (I use Venmo or Paypal), and the link to complete the practice test. Once you have a website filled with reviews and testimonials, you need to get people to your website. One way you’ll do that is by your presence on Google My Business and Yelp, as well as by your SEO. But, another way you need to get people to your website is by advertising. NONE of these were worth the time or money I spent on them. However, the one that is worthwhile are Google Ads. Google Ads appear when people search for certain keywords. You pay per click, depending on the keyword. So, if you can’t get ranked in the right spots by SEO, Google Ads make up for it. Nick’s Notes: Google AdWords is an amazingly powerful tool. It allows a brand new business (yours!) to reach the top of the search results for the exact phrases your target customer is typing in. How cool is that? But it’s also easy to get burned and waste money, so start slow and refine as you go. The important thing to remember about Google Ads is that you won’t get them right the first time. You need to experiment with Google Ads for maximum effectiveness, changing up your ad-copy and landing page when you can. Test-prep tutoring can be very lucrative, as people are willing to pay a lot for it. However, in order to become a test-prep tutor, you need to take the time to learn your niche and learn how to effectively market yourself. That’s what I did. I worked hard to learn my tests and my marketing. 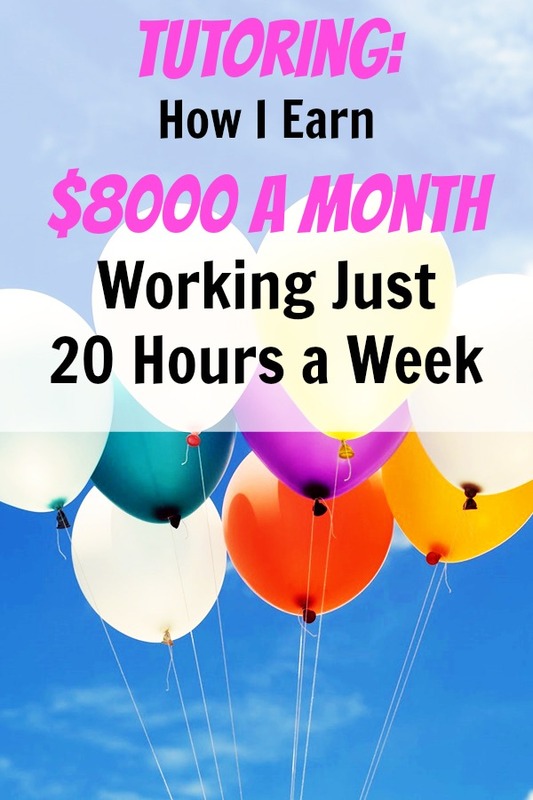 Now I work a maximum of 20 hours a week on my own schedule, have clients who love working with me, and take home $8000/month. This gives me the time to pursue the projects that I find truly interesting, which take up far more of my time (and hopefully will eventually provide a far greater percentage of my income). For instance, in this past year, I’ve launched a new company, developed an app, and developed a WordPress theme–all funded by the profits from my tutoring. Big thanks to Trevor Klee for this in-depth write-up! Trevor is a Boston tutor for the GMAT, the GRE, and the LSAT. He blogs about how to start a tutoring business at JustAddTutor.com. Trevor thank you for being so transparent and giving us a step by step guide!! This is incredibly helpful–I’ve been tutoring for six years for a large company, and they keep half of my profits. I was never sure how to get customers without them, though. Now I have the steps laid out for me! Thanks! This sounds cool, but I can’t help but think I’d feel like an impostor if I just threw up a website today and started calling myself a tutor. Is there really no certification required or anything like that?